I wondered if my experiments with an earlier model CD104 may be of use, I realise all the chips are different, however earthing/grounding was as I understand a problem with early Philips CD players. I have a 1984 Philips CD104 CD player (grey case) replaced in the 1990's when it persistently malfunctioned. I did some research on the internet, it appears that most problems with this CD player result from "Griplets" a type of hollow rivet that goes through the double sided PCB joining the ground planes. The "Griplets" fail simply re-soldering does not work even if a meter shows continuity! as strongly suggested on various forums using a fine drill the "Griplets" identifiable as blobs of solder were drilled through then wires were pushed through and soldered on each side. This player has fixed signal/phono leads so a pair of my DIY leads were soldered in place, though we had chassis RCA sockets to hand this saved on soldered joints. The result was even better than I remembered & functioned flawlessly. The CD104 uses a TDA1540 DAC chip which is 14 bit when Philips discovered that Sony and others were coming to the market with 16 bit Players Philips pushed it's engineers into adding oversampling in the guise of a SAA7030 error correction chip. My reading indicates a Non Oversampling (NOS) mod which involves desoldering & removing the SAA7030 chip and adding a 1k resistor to an isolated leg on another chip to provide 5v to enable 14 bit's to be read, the result is worth the effort and will come next. 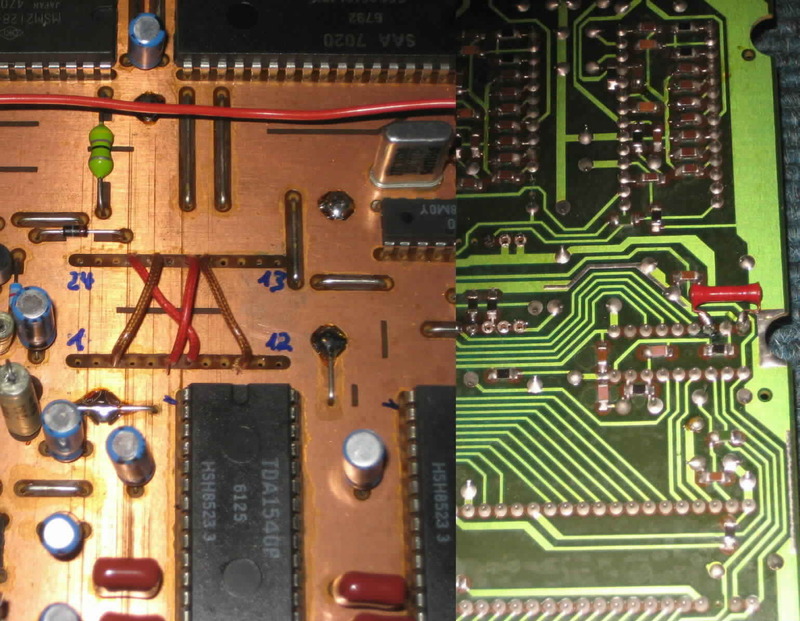 Below is a photo from the internet showing the cross wiring replacing the SAA7030 chip and resistor together with a few of the "Griplets". Thanks for the thoughts. No griplets in the CD160; there are about 6 off 0V wire links soldered to the upper ground plane which appears much more reliable. Enjoy your machines. I would love to try one out but I have two CD160s, a Delta 170 transport I have had for some while and a Micromega Drive 3 (VERY LOUD transformer) plus a Stage 2 that works but bought for spares for the Drive 3 so I don't think SWMBO would be best pleased! CD160#2 fully recapped and working fine now This one has the uP board. Also did the bipolar on the CD160#1 servo board so both now fully recapped; this machine has the chip rather than the uP board. Did some measurements on both machines and found that the noise on the +5V supply to the SAA7220 was about the same on both machines so the ALWSR was not giving any advantage over the bog standard supply (not the fault of the ALWSR) so I decided to re-arrange things. Having seen that the arrangement on the Arcam 170 used a 2u2 RF inductor between the reg'd 5V supply and the SAA7220 supply pin, I did the same on the CD160#1 so this now has 2u2 inductor feeding 220uf pana FR and changed the // 22nF for 100nF axial. RF noise has now gone down to 12mV from 30mV. I then used the ALWSR to supply the +5V on the DAC chip (which had 10mV RF noise and 20mV modulation being fed through a 4R7) but now has 5mV RF noise and <5mV modulation. Will give this some settle-in time and have a listen over the weekend. Well I have found that the room has much more bearing on the sound than I thought. Small changes in seated position have more effect on sound than any of the three sources (CD160#1, CD160#2 or Arcam Delta 170 / Bushamaster 2) so going to see if I can get my Stax earspeakers sorted (rotted foam in the backs and no inserts so sound very bright at the mo) and take it from there. The change in weather (colder) has bought the intermittent skipping problem with my modded CD160#1 back. This is now fully recapped with circa 30-40 hours use, and some discs are worse than others but after about 20 minutes "warm-up" it will play faultlessly for several hours - including the sections of the CDs that skipped when the machine was "cold". Any pointers to look for please e.g. could it be laser current adjustment? I re-flowed all the regs during recapping so this shouldn't be a problem, and all the regged supplies have been scoped and are OK.
You have another working one now too? I swap first the disc clamp, and then the laser assemblies, between to see if it is a worn clamp or laser issue. Thanks for the reply but unfortunately #1 has a CDM2-29 mech and MAB8441 whereas #2 has a CDM2-10 mech and uP panel IIRC (might have the mech numbers transposed, not sure) as well as different control panels so can't interchange. Will re-read the CDM2 manual and see what that says. In the meantime, any pointers anyone? In your Naim CD thread, you replaced the SAA7220 chip with a "SAA7220B". What effect did this have? Reason I ask is that I noticed a loss of detail in the upper-mids region with the CD160 (either with the internal dac, or an external Bushmaster II) but when I used my Arcam D170 transport with the Bushmaster II, this pretty much cures the problem, indicating that the "issue" in the CD160 is somewhere up to or before the SAA7220 chip. To be honest, I’d be looking at differences in PSU rail implementation for the 7220 between Arcam and Philips - from memory Philips budget machines share a single 5v rail for all chips...bet the Arcam doesn’t do that? Thanks for you informed and interesting response. I will have a read through all this when I have time to do so. I did some further listening over the weekend and it is closer than I thought actually. Using copy CDs (two originals) one in each machine and switching back and forth I think it is more a slight difference in presentation with the CD160#1 having a slightly recessed upper-mid / accentuated sibilants whilst the Delta170 / Bushmaster II is slightly more even-handed. I decided to compare the CD160#1 and #2 machines (#1 modded, #2 just recapped) and the #2 machine is much closer to the Delta170 / Bushmaster II combo, so I will try swapping out the 100uF fine gold caps I put in for coupling in the #1 and take it from there. The SAA7220P/B is an improved part over the SAA7220P/A and is an easy drop-in upgrade. It is often reported that you should use the SAA7220P/A with the TDA1541 and SAA7220P/B with the TDA1541A but I believe that this is incorrect and you can in fact use the P/B with both TDA1541 and TDA1541A chips. The SAA7220 is a very noisy and power hungry chip. It is very important it is to optimise the power supply decoupling of the SAA7220 and I suggest a 47uF Oscon for bulk decoupling plus a 0.1uF X7R ceramic positioned as close as possible to the +5v pin to ground. Giving the SAA7220 its own dedicated power supply was the single biggest upgrade I made to my Arcam Alpha 5 CDP. Swapping out the Nichicon FG electrolytic coupling caps to film capacitors is another obvious upgrade. A pair of 4.7uF Wima MKS capacitors with 5mm pitch will drop straight in without any messing about and will be better than any electrolytic. Better still if you can fit some small compact metalized polypropylene or polycarbonate coupling caps (e.g. Panasonic ECW-FD2W225J ). Don't bother with huge audiophile film/foil caps on flying leads, they'll do more harm than good. He has a good selection at reasonable prices. Interested to hear your thoughts on coupling capacitors. I first added some bypass (0.68uf MKS2) to the 100uf FG on #1 machine which made a slight improvement but no vast change. Over Easter I changed out the 100uf "generic" electros that I'd put in my #2 machine for the 6.8 Wima MKS2 that I had. What a difference after a few hours running in: more / better defined bass and sibilants much better controlled as well as better imaging with upper-mid "softness" almost gone. I'd like to cure this slight remaining "softness" in the upper mid-range. You have mentioned polycarbonates. What would you say the sound of these is like please? My #1 CD160 was playing up really badly (got worse over last 6 months) so I took the servo board out which reminded me I hadn't changed the 1.5µF NP cap on the radial arm motor. Still don't have a direct replacement, but the circuit diagram in the CDM2 manual shows this as 470nF so fitted a 0.68µF film cap and Robert's your Fathers Brother. Further update on above post. My #1 CD160 was still playing up a little so I had the base-plate off the laser swing arm, having first made a note of the positions of the fixing bolts in the plates (which were slightly off-set). Once removed and the small ball-bearings removed it was clear that tiny remnants of grease were present but had dried-out. I cleaned the balls with kitchen-roll and put a tiny blob of no-rot grease on the balls to fix them either side of the swing-arm and then a further drop of grease on the seating in the transport and base plate, put it back together noting the positions of the bolt heads and it was run for about 6 hours over 2 days without a murmur. Dowser and Mike P like this. Thanks Mike, I'm well chuffed. Been reading this (and other related threads) and note that the Philips CD160 uses link wires for these 3 connections and thought it might be worth trying these mods with small ceramic discs on data and WS lines to the earth-plane adjacent to the TDA1541. Any thoughts please on what improvements this may yield? Is it a matter of tweaking with a 'scope ... plugging-n-chugging values until the signal looks clean? BTW: About that modded CD2 ... I'm sure you've had some pretty decent DACs/CDPs pass thru your system ... so how does it (sonically) still hold up for 16/44.1? I just had a read through my Arcam Alpha 5 notes and I'm pretty sure I used 5.6pF NPO caps on the DATA and WS lines only. PS: The spec of this player is now a bit different to how it was when this thread ended. The big silly coupling caps have gone now and I finally settled on the original JRC5532DD opamps too! Initially I 'thought' there was a large difference, so had a long listening session to give it time to burn / settle in. The following day I did a direct comparison of modded (#1 player) with un-modded (#2 player) but I couldn't discern any audible difference. Unfortunately my room is square and I get terrible problems with peaks / nulls so I have to be very precise with my listening position (which can make an audible difference to tonal balance) so will have to try a back-to-back with headphones to see if this reveals anything. Interested to hear others thoughts on the effect of this mod. Just been through the above thread. Didn't realise the decoupling on the TDA1541 supply pins was so critical. I only have generic 'lytics on these so will have to give this some thought. It may explain the slightly "sucked-out" upper mid and boosted lower treble which I have that sounds over-etched / synthetic. Yes the choice of decoupling caps for the +5v, -5v and -15v supplies has quite a strong effect. I'm afraid the only way to find out what you prefer is to experiment. FWIW my favourites include Silmics, Rubycon ZLH and Panasonic FC and 100uF-220uF seems to work for me. I've tried various types of Oscons but in the end I've come to conclusion that they just don't sound right. It's also worth experimenting to try the above with and without small bypass caps; either film or ceramic. The choice of decoupling caps for the opamps also has a very significant impact. In your Naim CD thread, you replaced the SAA7220 chip with a "SAA7220B". What effect did this have? The TDA1541A is an improved version of the TDA1541. Similarly SAA72220P/B is an improvement over SAA7220P/A. However, the TDA1541 work best with the SAA7220P/A, it will work but with P/B but it isn't optimal.